I remember well your mystical writings of this magical day. And Lorenzo missed the adventure! 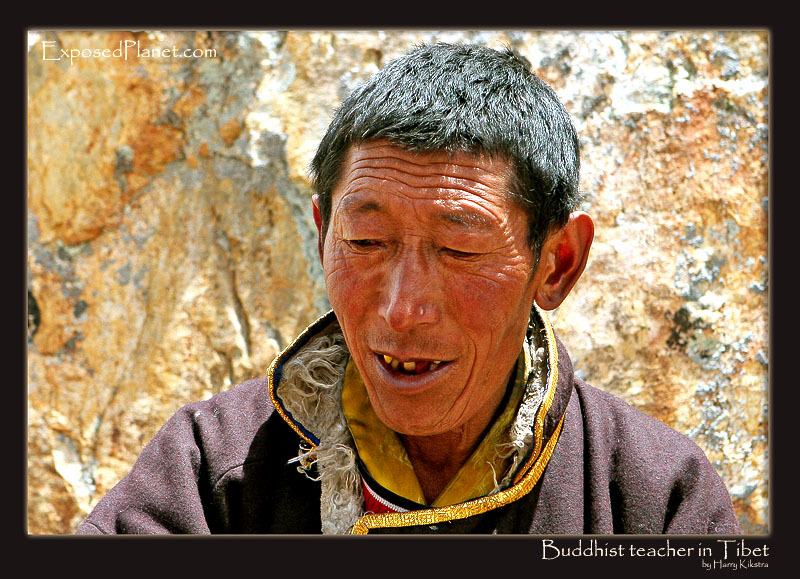 I like this photo of the Buddhist teacher against the beautiful rock background. Great colors! The story behind "Holy teacher in Tibet"
‘The Great Scholar Pedma Sambhava’s Magic Cave’ it said on the stone in from of his house. It sounded like a crappy carnival attraction, but once we were welcomed we entered a magical world. The scholar did not speak English and though the cave was halfway between Rongbuk Monastery and Everest BaseCamp, it is passed by most tourists. In the ruins a hidden cave contains an imprint of the Buddha’s hand, a kind of rebirthing test and a test of good faith and soul through the dark tunnels through avalanche debris. He took a few hours to talk about all without requesting payment for it – though we did donated him some at the end – , fortunately a Chinese man who spoke some English could translate a bit. It is nice to see how people from a different culture take time to show you around their world. 'The Great Scholar Pedma Sambhava's Magic Cave' it said on the stone in from of his house.It sounded like a crappy carnival attraction, but once we were welcomed we entered a magical world. The scholar did not speak English and though the cave was halfway between Rongbuk Monastery and Everest BaseCamp, it is passed by most tourists.